anything at all being done. "After you, Alphonse," says Gaston. "No, Gaston, after you," is the reply. And with neither willing to proceed before the other, both are stymied. But practically nobody knows who those excessively courteous Frenchmen actually were. They were comics characters, creations of Frederick Burr Opper, one of the most highly respected cartoonists of late 19th and early 20th century America. Opper, who had made his name in magazine cartoons, book illustration and other areas during the 1880s and '90s, was hired in 1899 by William Randolph Hearst, in an attempt to blunt criticism of Hearst's Sunday comics pages. Critics alleged that Hearst's comics, which included such declassé series as The Katzenjammer Kids and Mr. Jack, were major factors in the ongoing de-gentrification of the country. Opper's creations for Hearst included Willie, Our Antediluvian Ancestors, Hans from Hamburg, King Jake and many other comics. He also did political cartoons featuring Willie and his Papa, i.e., President McKinley and the oligarchical trusts that were regarded as such a bane to the economy back then. His three best-remembered comics are And Her Name Was Maud (in which farmer Si Keeler repeatedly got kicked by a mule named Maud), Happy Hooligan (in which a well-meaning hobo was repeatedly reminded of his position in Society), and of course, Alphonse & Gaston. The latter were introduced in 1901, and remained part of the Sunday comics for years. (Many sources say they started in '02, but a less fully-developed version was seen as early as Sept. 22, 1901.) They weren't in every week, as there was no absolute requirement back then for features to appear on a completely reliable basis — Opper would do a page or two a week, and the Alphonse & Gaston series was frequently the focus. Hearst published two collections of Alphonse & Gaston pages, one in 1902 and the other a year later. There were also a couple of comedy shorts about them from The Biograph Company (which also produced films about Foxy Grandpa), which came out in 1902 and '03, and a stage play that was produced in several local venues roughly a decade later. The "Alphonse, Gaston" routine quickly became a familiar refrain throughout America, and as a cultural artifact, it has survived to this day. But as a gag vehicle, it seems to have been limited (a fact demonstrated again a couple of generations later, when Warner Bros.' Goofy Gophers, founded on the same schtick, failed to become major stars). The introduction of a third friend, Leon, didn't add enough to sustain it, and gradually, the Alphonse & Gaston page stopped appearing. They remained as occasional supporting characters in Happy Hooligan (as did Maud the Mule), and did do better in that role than in the lead. They were still familiar enough in the late 1930s and early '40s (after Opper's death), to be licensed occasionally as advertising spokestoons. And of course, people still sometimes say "After you, Alphonse" etc. But Alphonse and Gaston themselves haven't been seen in decades. Text ©2003-07 Donald D. Markstein. 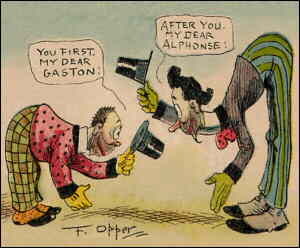 Art: Alphonse & Gaston are in the public domain. This image has been modified. Modified version © Donald D. Markstein.